A late surge in the second half of extra-time put Kyles Athletic through to their third Scottish Hydro SSE Camanachd Cup final in four seasons with a 3-2 victory over Newtonmore. And Kyles' reward for 120 minutes of competitive and, at times controversial, shinty is a meeting with Lovat at Mossfield Park on 19 September. Kyles will have good memories of an Oban final in 2012, while this is a rematch of the 1953 showdown when Lovat secured their only victory in the sport's most prestigious competition. At Taynuilt, the hour mark was approaching when a glorious 40-yarder from Dunkie Kerr put Kyles ahead. However, they could not hold their lead and Paul MacArthur equalised after 71 minutes when he pounced on a rebound from one of several fine saves from John Whyte, this time from a disputed penalty. Whyte again worked wonders against Fraser MacKintosh although Newtonmore's Mike Ritchie turned in equally good work at the other end. The next breakthrough came when Roberto Zavaroni burst through, amid Newtonmore claims of an infringement, to put Kyles ahead again with a shot that appeared to take an early deflection. With Newtonmore pushing all 11 outfield players goalwards, Zavaroni was in the thick of the build-up to Kyles' third and decisive goal from Gordon Whyte. Evan Menzies got a second for Newtonmore during stoppage time in extra time, but Kyles held on for the remaining 20 seconds. Inveraray emerged as prime candidates for the drop from the Marine Harvest Premiership when they lost 2-0 at home to Oban Camanachd in their bottom of the table four pointer on Premiership derby day. Glenurquhart are now just a point adrift of second placed Kyles after their 1-1 draw with Lovat in Drumnadrochit. Fort William moved into the top half of the table with a 3-2 home win over their local rivals Lochaber. And Skye put themselves in pole position for a move up from the second tier National Division when they recorded a 4-2 home win over the only other likely contenders Kilmallie to go two points clear. Daniel Cameron's early opener gave Camanachd's survival campaign a huge boost and Malcolm Clark scored the goal which finally took them off the bottom. 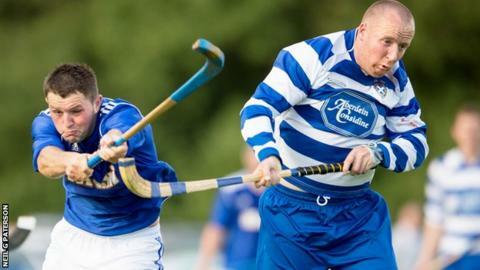 Apart from staying above Inveraray, Camanachd's next objective will be to escape the play-off place by catching Kingussie, who are five points ahead but have played five more games. Lewis Tawse got the breakthrough for Lovat early in the second half but Glenurquhart's Iain MacLeod equalised just five minutes later. Daniel Stewart scored the second minute for Fort William who then went 2-0 up through Alexander MacMillan. Just on half time Stuart Callison got one back for Lochaber but the second half was barely under way when Ryan Campbell cancelled that out. And so it remained until Callison, as he had done in the first, also scored in the final minute of the second half, but Fort held on. In Portree, Skye rushed to a 4-0 half time lead with a hat-trick, including a penalty, from Jordan Murchison split by a goal from Shockie MacLennan. Liam MacDonald and John Stewart struck back in the last quarter hour but by then it was too late to prevent Skye going two points clear with four games each to play, including a second head-to-head at Kilmallie on 12 September. Elsewhere in the National Division, Glasgow Mid Argyll comfortably beat bottom side Ballachulish 4-0 away from home while in a cliffhanger at Bught Park, Inverness went ahead twice against Beauly before going down 5-3.